The two co-founders behind AppGratis are working on a new project for mobile developers. Batch Insights is a push notification aggregator that will let you search, filter and manipulate notifications from thousands of popular apps. This service is a good way to benchmark your competitors when it comes to push notifications. “With Batch Insights we’re on a mission to index all the non-specific smartphone notifications in the world,” AppGratis and Batch co-founder and CEO Simon Dawlat told me. “Our service lets you search through public notifications for keywords, track your competitors, gain market insights and find inspiration for your own mobile campaigns,” he continued. 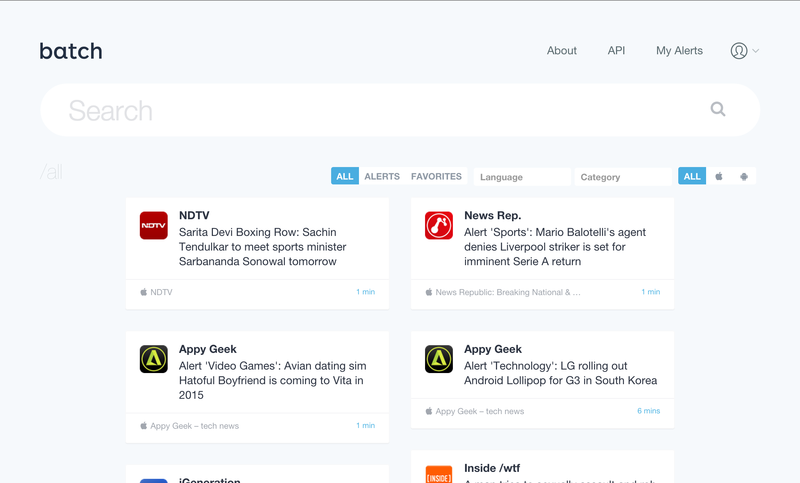 For example, Batch insights will be particularly useful for news editors who write breaking news notifications. They might want to see what competing media companies are sending without having to install every app. As a freemium game developer, you could see if your competitors use push notifications and events to bring old players back in the app with a simple search. Originally, AppGratis is an app discovery service — every day, people would receive a notification to download a promoted app. While the AppGratis app was pulled from the App Store last year, the company is still around. As the company told me last year, it refocused on its website and newsletter to send app promotions for iOS and Android apps. Yet, it probably doesn’t have the same reach as in early 2013, when the company raised $13.5 million. Existing AppGratis investors are now also Batch investors. But how exactly does the company collect all these notifications? “I can’t explain in full details how we’re doing it for obvious competitive reasons, but what I can say is that we combine a lot of mobile virtual machine activity with network proxying to collect the notifications,” Dawlat said. An API is coming soon to take advantage of all this data. The team is also working on other analytics tools for mobile developers. Batch is an interesting spin-off that makes a lot of sense for AppGratis. It’s still in the mobile space, and it’s still about optimizing reach. Now, it remains to be seen whether the two founders can recreate the same traction for Batch Insights and other upcoming services.